Faced with potential blindness because of a recurring detached retina, James Moore makes a last attempt to save the sight in his right eye. Hoping for a miracle, he travels from Austin to Memphis to meet with eye specialist, Steve Charles, a physician whose inventions of machines, tools, and techniques have been transformative in the field of retinal surgery, and who has performed more vitreoretinal procedures than anyone in history. As he struggles to see, Moore comes to realize that while no doctor has perhaps had a broader impact on vision and ophthalmological surgery, no one outside the field really knows who Charles is or what he’s accomplished. Moore decides to change that. New York Times best-selling author of Bush’s Brain and Emmy award-winning television news correspondent James Moore documents his own journey in the struggle to save his eyesight, while also weaving in a detailed account of the doctor’s profound accomplishments and their global impact on people. 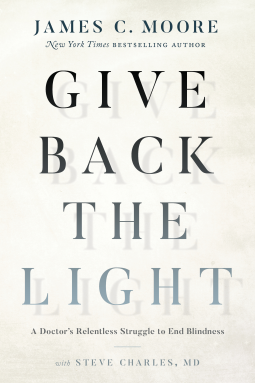 Part biography, part autobiography, Give Back the Light is a dual-track narrative that highlights the challenges and achievements of modern health care. ​This is a book about a physician who has been intimately involved in saving the vision of millions of people through the spread of his technology and surgical techniques. Dr. Charles is an historical and yet mostly unknown figure who has lived a remarkable life of great importance. In the telling, Moore helps readers view the wider world and their contributions to it in different light, and offers a prosaic understanding of the sheer joy of just seeing. James Moore is the best selling author of Bush's Brain.